Ethiopian Prime Minister Meles Zenawi, who has died at the age of 57, was rightly described as an important Western ally in the Horn of Africa. Yet, he is an unlikely partner for Western democracies. A hardline Marxist-Leninist, who once believed the Soviet Union and China had sold out and looked instead to Albania, Mr Meles believed in running a tightly controlled country. But he was a crucial supporter of the US war against Islamic fundamentalism in the Horn of Africa. Although Washington was reported to have attempted to dissuade Ethiopia from a full-scale invasion of Somalia in 2006, the US backed Prime Minister Meles's determination to prevent al-Shabab, then a part of the ruling Union of Islamic Courts, from establishing an al-Qaeda stronghold in Somalia. Al-Shabab, an al-Qaeda-aligned militant group, still controls swathes of land in rural Somalia, but is on the back foot militarily, having lost several key bases in the past year - some to Ethiopian forces. There were reports of US special forces operating from Ethiopian soil and close co-operation between Ethiopian troops and the US Africa Command base in Djibouti, Camp Lemonnier. Mr Meles was a towering intellect who took an MBA from the UK's Open University with glowing compliments from his tutors, while also running the country. When then-US President Bill Clinton toured Africa in March 1998, he hailed the Ethiopian leader, along with Paul Kagame of Rwanda and Yoweri Museveni of Uganda, as a new kind of African leader who the West could do business with. The UK leader at the time, Tony Blair, saw Mr Meles in much the same light, appointing the Ethiopian leader to his Africa Commission. The commission was set up to find solutions to poverty in Africa, but perhaps its greatest achievement was to enshrine development aid in UK foreign policy. When the British Conservative government won power in 2010, newly elected Prime Minister David Cameron also pledged to increase aid spending until it reached 0.7% of GDP - the target set by the United Nations. 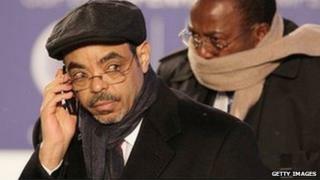 At home, Mr Meles instituted a form of ethnic nationalism. Drawing on the Soviet leader Joseph Stalin's theory of nationalism, it allowed all peoples the right to self-determination. In principle, nationalities could even leave the state, but in practice this was never allowed. The country's peoples, who once saw themselves as Ethiopians, had to re-define their loyalties along national lines - a hard choice for families that sprang from more than one ethnic group. Mr Meles's party - the Tigray People's Liberation Front (TPLF) - established a series of front organisations to represent Ethiopia's many nationalities. But these were tightly controlled from the centre, allowing Mr Meles - who ruled since 1991 - to dictate policies and politics throughout Ethiopia. The TPLF will have had at least two months to contemplate the prime minister's demise, since there was little secret that he was ill. Within the tightly knit party elite there will have been long discussions about succession. But only those on the inside will know whether this resulted in consensus, or whether Mr Meles's death will herald a bout of in-fighting that will tear the country apart. In the end, Mr Zenawi will be remembered for setting his country on a path of economic growth, but at the same time undermining the multicultural nature of Ethiopian society, and setting in its place an ethnic nationalism.